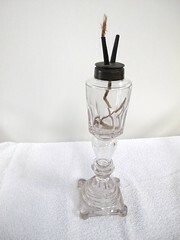 During the summer of 2011, Brian Wood and Tony Frommelt lent the Society a large number of the nineteenth century oil lamps from their collection for an exhibit. The lamps in the exhibit illustrated the history of the oil lamp inAmerica. What follows is a brief synopsis of that history illustrated by a few of the lamps that were on display. The Argand lamps became popular immediately and reached the United Statesat the beginning of the 19th century where continued improvements were introduced over the next 80 years. 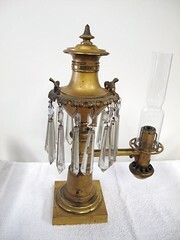 The original Argand-type lamp had a large fuel reservoir in a tank as high as the lamp that provided pressure to force fuel into the wick.For thousands of years the only source of artificial lighting was either candles or lamps made of shallow bowls with a wick or small rag floating in animal fats or oils which often gave off more smoke than light. 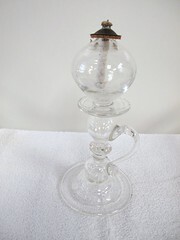 Then, in 1781, a Swiss chemist, Aime Argand, introduced the first successful oil lamp. The primary key to his success a metallic wick holder that allowed far more air to reach the flame producing a far brighter and clearer light. The addition of a glass chimney increased the air flow while sheltering the flame from drafts. The result was lamp that produced seven to ten times as much light as a candle with far less smoke. Fuel improvement, especially the rapid expansion of the use of whale oil, ended the need for this tank. Whale oil, which was liquid at room temperature, could rise up the wick without pressure, obviating the need for the tank. With that, the oil lamp achieved its classical form, with a base, a “font” or tank for holding the fuel, the burner, the chimney, and, much later, a shade. 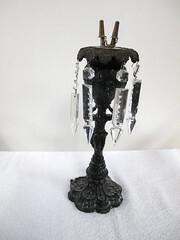 With this, most of the changes in oil lamps were a product of new technologies related to glass. 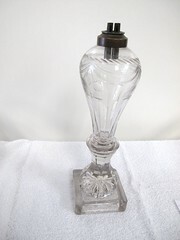 While early lamps were usually made of metals such as brass, by the 1830s lamps made almost entirely of glass became preferred. 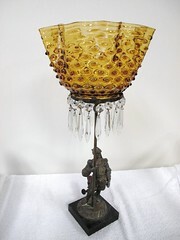 Initially the two major structural parts of the lamp, the base and the font, were made of hand blown glass, which was very expensive. Soon, however, means were developed to form the glass parts in molds. Methods were also developed to create glass with layers, allowing patterns to be cut in the top layer revealing the glass in the second. Even the glass changed. Flint glass, which was made from sand derived from flint, was initially preferred for lamps due to its clarity. However, in mid-century, soda-lime glass was introduced that was far cheaper. The final major development came in the 1850s with the introduction of kerosene as lamp fuel. Up to then, whale oil was the preferred fuel for lamps and the rapid increase in the demand for the oil made whaling the fifth largest industry in Americain the first half of the 19th century. But whale oil was extremely expensive, creating a major effort to find a less expensive fuel. Early experiments with hydrocarbons derived from coal were unsatisfactory due to the volatile nature of the fuels, with a number of cases of lamps exploding. Kerosene, which was discovered separately in bothPoland and in theUnited States, however, was far less volatile, and therefore, completely safe. The discovery of petroleum inPennsylvania in 1858 meant that kerosene could be produced in abundance and at a third the price of whale oil. 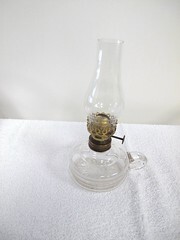 Within a few years, most oil lamps were designed for kerosene. But even kerosene cost around fifty cents a gallon, which would have been about fifty dollars a gallon today. At that price, artificial lighting in the home was still a luxury, a fact reflected in the high degree of artistry in the lamps. Lamps were often used as much for ornamentation in a room as for a source of light and reached their peak in artistry in the second half of the century, which became the golden age of American oil lamps. Then, at the end of the century, the use of natural gas as a source of light was developed. Gas produced a far brighter light than oil or kerosene, was much cleaner, and far less expensive. 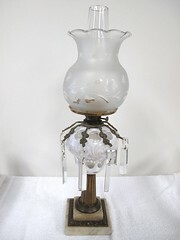 The introduction of gas lighting ended the age of oil lamps and with it the artistry that went into making lamps. 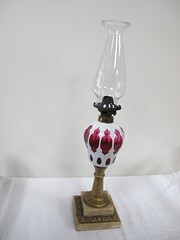 A few artistic gas lamps were developed, but, gas lights soon became simple and inexpensive everyday means of providing light. Lamps representing some of these developments are pictured below. 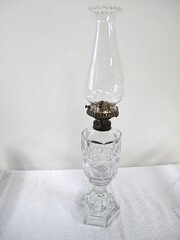 Most were made by the Sandwich Glass Co. of Sandwich, Massachussetts, which was, for most of the century, the leading maker of quality oil lamps in America.